Ever since I can remember, I’ve wanted an easy way to work with the same files on multiple computers. I started my computer training center in 1983 with 12 Apple 2e computers. I didn’t have a computer that was my own – they were all designated for the classroom. So, I kept my files on the 5 1/4 inch floppy disks, and carried the disks with me from computer to computer. In the early 90s, we used a Novell network. That was great! All the work files were on the network server … it didn’t matter which computer I used, I just connected to the files on the server. I could even connect remotely from home and, they were the same files that anyone else in the business would access as well, so collaborating was a piece of cake. When I first heard of Dropbox I was skeptical, I thought it was a way to work with your files directly on the Web – something that just isn’t practical in our world with flaky Internet connections as we travel. But no … what it actually does is to upload a file to the web, then download it to your other computers. Any time anyone makes a change, it re-uploads and downloads that same file. It Synchronizes! So, I can work on a file on my computer, in the specified Dropbox folder; when I’m done and I save it, it automatically uploads to our secure account area on the Dropbox website, *and* downloads to Jim’s Dropbox folder. Hurray!! No more emailing him files, or copying to a thumb drive and creating multiple duplicates. Or, worse yet, no more of Jim printing 100 copies of an outdated version of something I worked so hard to update! Both Jim and I had to download the Dropbox software to our computers. You get it from www.dropbox.com and it’s free. 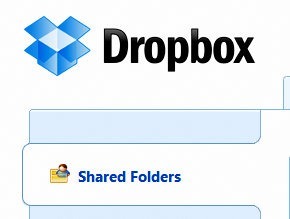 You now have a Dropbox folder on your computer. I created a \Dropbox\Geeks folder and ‘shared’ that folder with Jim. Now, let’s say I’m working on a Geeks on Tour Brochure and I want Jim to look at it and make any changes he wants. As long as we both work on the file located in our \Dropbox\Geeks folder, it will automatically be synchronized and we will both have the most recent file! So now, any computer file that we both need to have is kept in the Dropbox\Geeks folder. It’s wonderful! And, even if our motorhome with all 6 computers gets destroyed – those important files are on our secure account area on the Dropbox website. Just get another computer, download Dropbox, and we’re back in business! If we go over our 2GB free account limit, we can upgrade to a bigger account for a monthly fee. If this might be of interest to you, read more, and view the Dropbox Tour. I’ve been using Dropbox for a couple months now. We have it on all four computers. Love it! Rarely use the flash drives anymore. Another cool thing is that only the changes in the file are uploaded/downloaded. So, big files don’t take a long time if only a sentence was changed.